Max. input current at rated Output with 415 Volts. 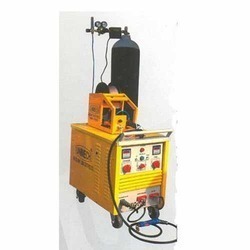 Banking on our enriched industry experience, we are engaged in manufacturing and supplying the most preferred range of Welding Machine and Equipment. The wide assortment of products offered by us include IGBT Inverter welding Machine, DC inverter machine, Welding Machine, Welding Cables ISI Mark, Welding Hose Pipe ISI Mark, Welding Consumables, Gas Welding Equipments, MIG Welding Consumables, Argon Welding Machine, AC . DC argon welding machines, AC Arc Welding Machine, Air Plasma cutting machine and Argon machine tigniter. The wide range of products offered by us are widely used in Wire industry, Air conditioners, Textiles machines, Water heaters, Electric appliances and Transformers. We take into account the prevailing trends and standards of the industry and offer suitable range of Welding Machine and Equipment. The entire range of products offered by us are widely appreciated for their unique features and cost effectiveness. Owing to these factors, these products are very popular among our wide client base.